This week I got to do something I've never done before. On Wednesday I got to visit our site at Black's Creek and I loved it. 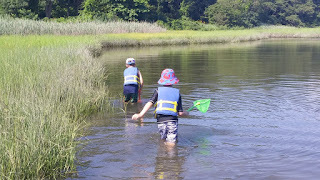 The day started with some exploration of the water which led to some interesting discoveries. The most interesting one was a green crab which was molting! I had never felt a crab so soft. It was interesting to see the difference in the shells. Exploring the creek one net at a time! At first the kids were nervous to pick up the crabs and settled on using a net to pull them out. I made sure they knew that as long as they do it the right way, the crabs can't hurt them. I showed them how to pull a crab out of the bucket without getting pinched and assured them that even if they did get pinched they would not lose any fingers. Finally, I got them holding the crabs and they realized there was nothing to be afraid of! After they overcame their fears of the crabs we decided to do a crab race. Instead of the typical race from the starting line to the water we decided to mix it up a bit. We drew a circle in the sand and placed the crabs in the middle to see which was fastest to leave the ring. 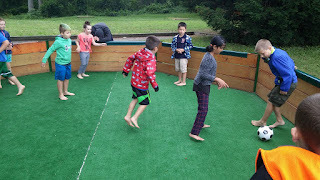 After we released the crabs back to their home we headed up to play gaga ball. I have never played gaga ball in my entire life. Basically, you stand in a fenced in circle and try to roll the ball into other people's legs. 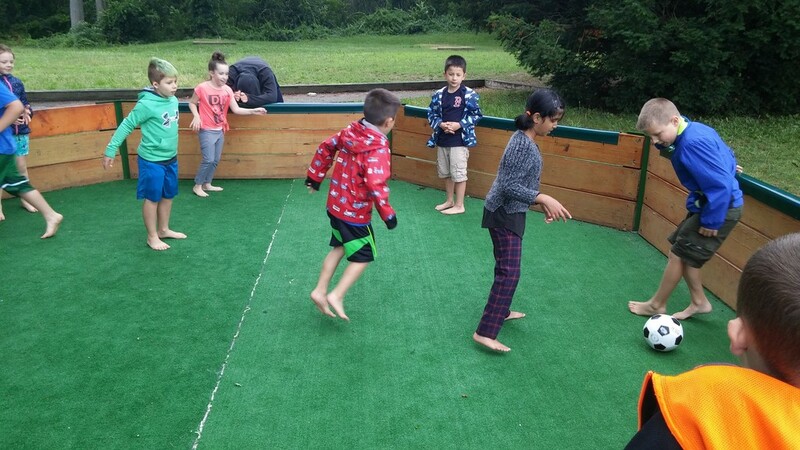 Getting to play the game with the kids was a lot of fun and I enjoyed learning to play. In the afternoon my group and I moved on to the Curley Community Center where we got to teach a bunch of kids how to fish. They were lined up at the rods waiting for instructions as soon as they got out there. Though we didn't have much luck with catching fish we did get quite a few crabs! An impressive moment was when one of the kids reeled in two crabs on one line. After that all of his friends wanted his help fishing! It was great to see everybody so excited about fihsing. See you at the creek!